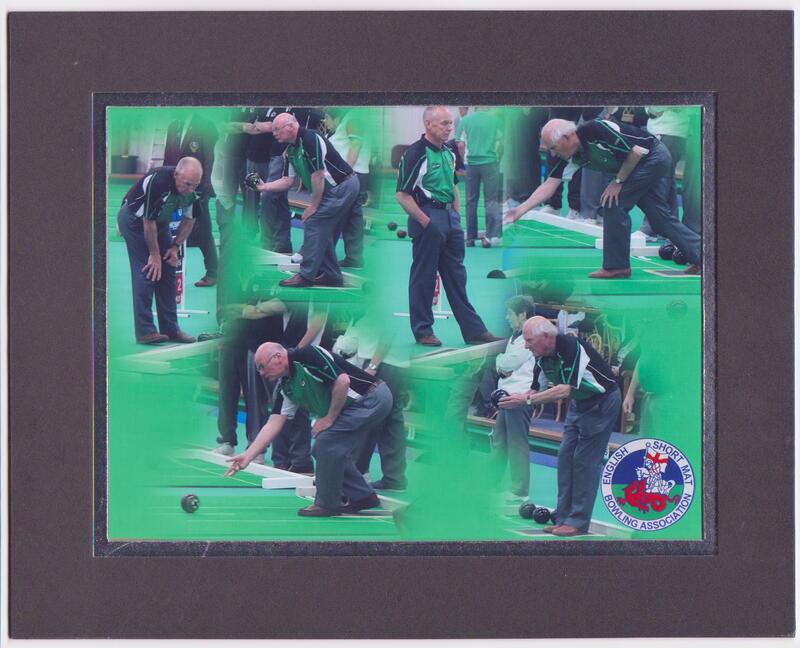 Bowlers from the county competed in the national finals held at Church Gresley in Derbyshire. Everyone thoroughly enjoyed this annual event competing against the best in the country. Unfortunately no honours were achieved. A snapshot of two of the events is shown below. In the pairs competition held on the 10th Richard Rose and Dave Grove opened well winning their first game in the round robin series by 10 shots to 7. They lost their following two games by 5 shots to 10 and 7 shots to 9. They did not, therefore, advance to the knockout stage of the competition. 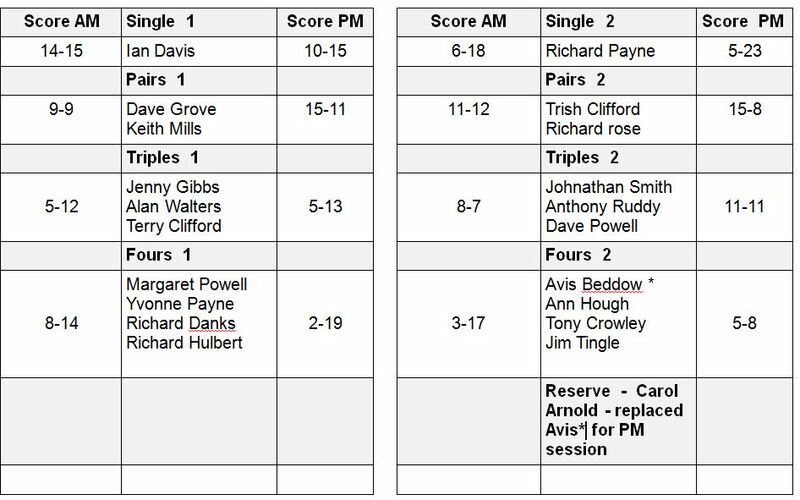 In the triples event on the 12th, the county’s team of Yvonne Payne, Richard Payne and Ian Davis progressed into the knockout stage of the competition, but unfortunately missed out from achieving further progression by a last end victory by their opponents. The second county team of Richard Rose, Malcolm Saunders, and Terry Clifford started their round robin series of matches with a heavy defeat. Their next two games, however, could not have been different with wins of 10 shots to 3 and 9 shots to 7, the latter game against a strong West Midlands team. The Worcester team were equal on points with two others in the round robin group but could not progress to the knockout stage because of a poorer shot difference. The County played in a short mat bowling exhibition match at the venue of the Our Lady of Lourdes Bowling Club in Kingswinford. The short mats used were somewhat different from the ESMBA short mats, being longer, wider, and missing the central wooden block. Two mats were used for this match with 10 bowlers from each squad taking part. The match consisted of two singles/pairs/triples/fours, resulting in eight separate independent matches. The county squad was in fine form winning 6 of the 8 matches. The county scored 89 shots with the Our lady of Lourdes scoring 35. One particular end of note during the evening ( although perhaps there were quite a number ), occurred in one of the two the pairs matches ( Richard Rose and Keith Mills ), when Keith produced a very consistent delivery. 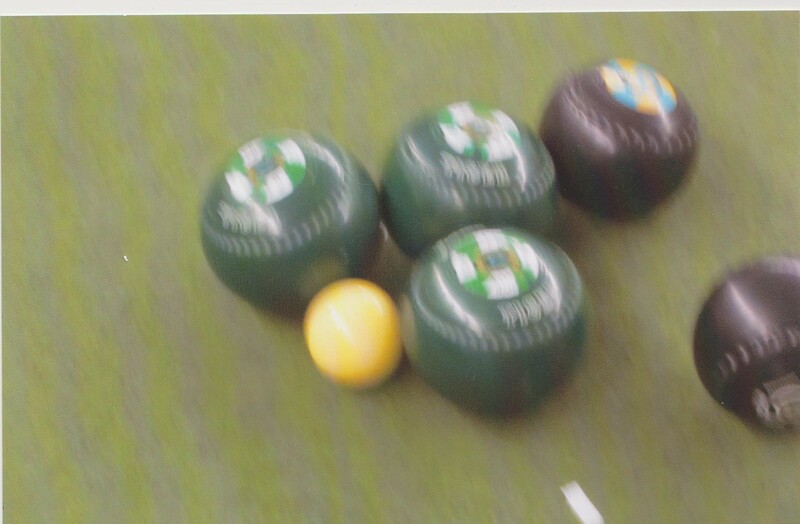 Keith’s green bowls are shown in the photograph below neatly clustered around the jack. A cup to commemorate the match was given by Dave Powell to the winning captain of the Worcester county Squad – Richard Payne. The County was drawn against Surrey in the quarter final of the 2015 inter county knockout competition held at Melksham, Wiltshire on the 21st February. The county lost, scoring 10 points against 30 for Surrey. The county’s shot total was 132 against 212 for Surrey. This means that the county is out of the 2015 consolation cup. The first session – We were optimistic about a good result, but were soon struggling. Ian Davis had a slow start, was 4-10 down but fought back to 14-14 and only lost on the last end. Richard Payne in his singles match had an off day. Both the pairs of Dave Grove and Keith Mills , and Trish Clifford and Richard Rose were struggling at the start, but came back well to achieve a draw and a loss by only one shot. The triples were a contrast. Terry Clifford’s team started well, stalled as the competition improved and unfortunately could not get back. Dave Powell’s team had a slow start but went on to win. The two fours teams unfortunately lost by uncomfortable margins. 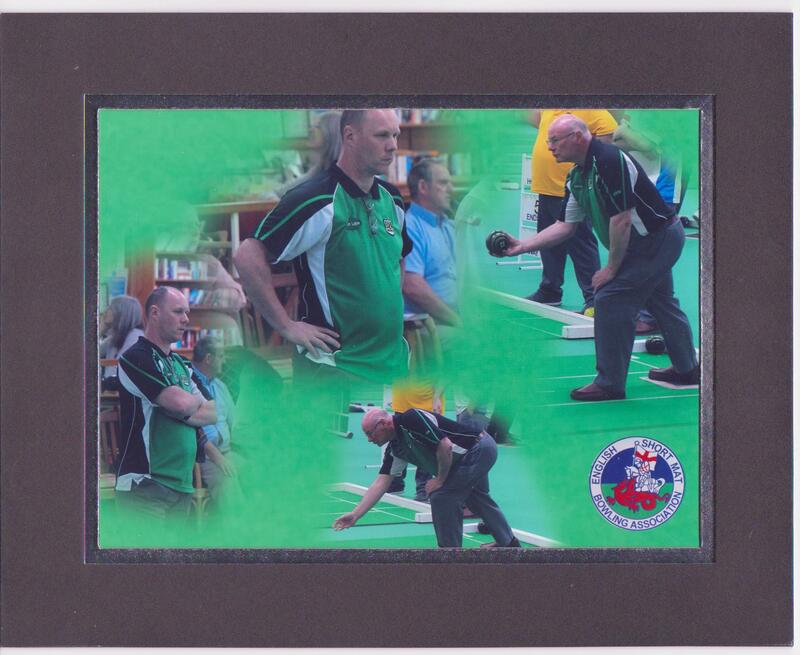 The Short Mat Players Tour for the 2014/2015 season continued with the staging of the “English Masters” tournament at the Bromsgrove Indoor Bowls Centre. This was an international singles tournament,open to all short mat bowlers, with a total of 144 competing from across Europe.Three Worcester County players took part and thoroughly enjoyed a weekend of quality bowling against the best in Europe. Further tournaments staged by the Short Mat Players Tour are programmed for later this year at Bromsgrove Indoor Bowls Centre. As this centre is the home venue for Worcestershire Short Mat Bowls Association, there is a unique opportunity for short mat bowlers within Worcestershire to participate. County players and non county players are urged to consider participating in these tournaments. The tournments are extemely well organised with the next one taking place on 22nd/23rd August. This will be a singles tournament with pairs and fours tournaments following in December. Entries for the August tournament open on 1st March 2015. The county narrowly lost to Herefordshire by 19 points to 21 . The county, however, scored more shots ( 188 ) against the visitors 180. During the first session Ian Davis was playing in excellent form with a big win of 17 shots to 9. The other singles match and the two pairs matches lost. Both the pairs teams of Tim and Keith Mills and Trish Clifford and Richard Rose were leading up to the ninth end but then faded. The two triples teams won their matches and Jim Tingle’s Fours team had an easy win. Unfortunately Richard Hulbert’s fours team eventually lost by 8 shots to 11. The County started the afternoon session with confidence. Ian Davis continued with his excellent form and won his singles match convincingly by 20 shots to 7. Richard Payne unfortunately lost his singles match by 10 shots to 19. Tim and Keith Mills narrowly lost their pairs match by 10 shots to 12, but the other triples team of Trish Clifford and Richard Rose won their match by a similar margin. 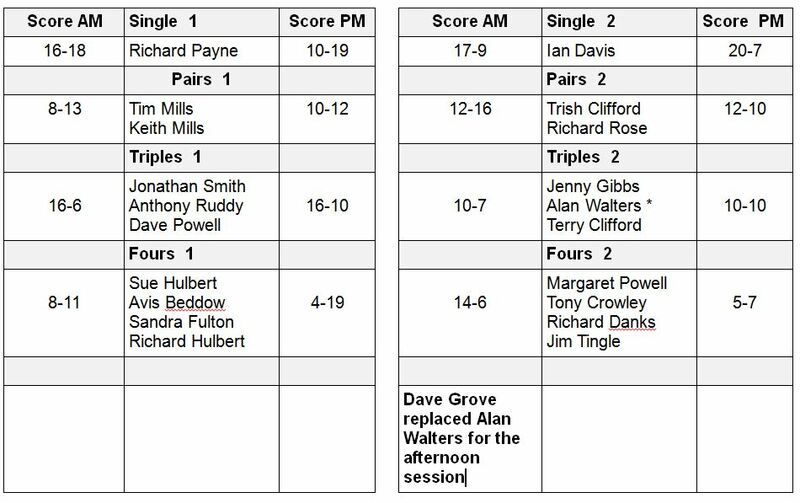 Dave Powell’s Triples team powered to a win with Terry Clifford,s Triples team being caught on the last end for a 10-10 draw. Both the fours teams lost their matches.